Tough guys can be Gentle men. Fighters can be athletes. There is skill and art amongst the brutality and blood. This is the new sport of the original form of fighting. Bare Knuckle Boxing. Jim Freeman, the promoter of BKB, has had a fight on his hands which he is winning. By getting legal sport status for bare knuckle boxing. Speaking to him in a recent interview I witnessed his passion, care and dedication towards the sport and the fighters. His focus is on bringing a more scientific approach to the sport. To make fair fights through match making and same day weigh-ins to try and prevent harsh weight cuts. Fighters in boxing and mma historically have and currently do put their bodies through harsh weight cuts and dehydrate themselves which vastly increase the risk of injuries in the fights. 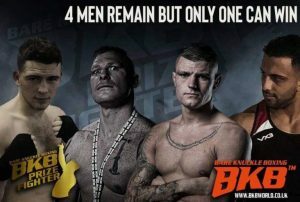 BKB returns to the 02 arena on 30th of March 2019 for the current middleweight prize fight competition. The semi final stage will see the 4 fighters battle it out to win the competition and the £10,000. Connor Tierney is an experienced amateur boxer with 45 fights. Only 24 years old, he won his only fight in BKB and has high hopes of more success. He is confident BKB is going to take off in a similar way to the UFC in it’s recent growth in popularity. He even hopes to see the promotion take place in his home town of Birmingham at the Barclaycard Arena (formerly NIA). Connor likes the fast pace of the fights and the atmosphere of the crowds and would recommend people to experience bare knuckle boxing for themselves. With a full time job as a Quantity Surveyor and a family at home he is working hard at his career in BKB. Eating healthy and exercising before and after work his dedication is testament to the professionalism of him and the other fighters in the competition. With no animosity towards his opponent he conducts himself like a gentleman outside of the ring. While in the ring however he is determined to win and wants to put on an entertaining show for the crowds. Ricardo Franco is 3 – 0 in BKB. He trains out of AVT gym in Leeds with trainer Danny Mitchell who is a former UFC fighter. Starting off his combat career in amateur boxing he switched to MMA and had 10 professional fights. His style is self professed as awkward and proclaims suits bare knuckle boxing. A knockout artist with stunning finishes in MMA and bare knuckle boxing he is an exciting fighter. He keeps his range and picks his shots, skilfully hurts his opponents and uses his jab like a sniper. Using his speed and not absorbing much damage he sees himself going on to win the competition. With his Partner and 2 dogs at home, his brother Mateus in the corner he is a family man. He’s focussed on his goal and thinks that his true toughness and mental strength will be shown in his next fight. This is going to be an exciting fast paced fight. Both Franco and Tierney having quick hands and big hearts, coupled together with slick skills and awkward movements. Establishing the jab will be the key to success as both fighters have lightning speed and move fast in and out of range. Dean ‘Smudger’ Smith has a record of 2-1 in BKB. He sees his entry into the bare knuckle boxing world has come at the perfect time as the promotion is up and coming fast, no longer in hay bails and is selling out big rooms like the 02. He joined his brother in the army at 17 where he found he had a talent for scrapping and was entered into the battalion boxing team. His heart getting him through fights more so than skill. Already demonstrating his heart and toughness in his 3 fights in BKB as he smiles through punches and bounces back up to his feet when knocked down. With his grit and determination he carried on through a bad cut in his fight against BKB British title holder Kris Tresize until it was stopped by the referee. Boxing above his natural weight of 64kg he is one of the smallest of the fighters. It doesn’t phase the smiling man from Leeds however as he uses that to his advantage by slipping underneath the jab to fight on the inside. He has adapted his style to be more patient and vary his shots to the body and head. The only fighter who has gone 5 rounds and being in the trenches with his previous opponents he believes he has an edge over James Connelly. When he got the call to fight for BKB he celebrated with his friends but got straight to training. Fighting out of the Golden gym in Leeds he is dedicated and working hard to become the victor of the pugilist prizefighter tournament. James Connelly 1-1 lost his last fight against Dan Chapman. However due to sustaining an eye injury Dan Chapman could not continue to the semi final round. James is glad he has a second chance in the competition. Having many ups and downs in his life He has managed to turn his life around. With 84 amateur boxing matches and wining the English title twice he has plenty of training which he’s showcased in his 2 fights with BKB. He has great respect for boxing and sees bare knuckle boxing as a different sport. Getting hit with bare knuckles is a completely different feeling to being hit with gloves. Working a full time job in construction, you will find him doing pull ups and training even in his break time. A self confessed ‘gym rat’ he feels like he has found his purpose in life which is fighting and went on to say ‘everyone needs a purpose in life’. He is fully involved in his career after a whirlwind of sequential events ended him in the prizefight competition. He is a seriously dedicated and focussed fighter and now has a reason to train hard. His movement and style is unique and has fluent movement with great footwork. A real character and looks the part with his powerful physique. ‘It’s boxing rules without any gloves on and it’s legal’ James Connelly. The mixture of styles, Connelly being a rangy slick sniper and Smith being a tough forceful inside fighter will be a great match up. Both tough, both tested and both have great character. ‘The key in this fight is to hit and not get hit, it’s as simple as that’. However with both fighters as skilful and as game as they are we are sure to witness their lion hearts, strong wills and willingness to battle on to achieve their goals in being victorious. These fighters are the pioneers of the new legal sport of Bare Knuckle Boxing. Making history and creating a pathway for their own legacy’s and the legacy of the sport of Bare Knuckle Boxing and BKB promotions. Making waves in the combat sports world it is a new sport with a new breed of fighter. Exciting times! Tickets are now available for the upcoming event on the 30th of March 2019 at the 02 indigo in London by BKB Promotions.